The ignition lock is designed so the key cannot be turned to the LOCK position and removed until the shift lever is placed in the P (Park) position. If the shift lever is not returned to the P (Park) position, the ignition switch cannot be moved to the LOCK position. Shift the shift lever to the P (Park) position with the ignition switch in the ON position. 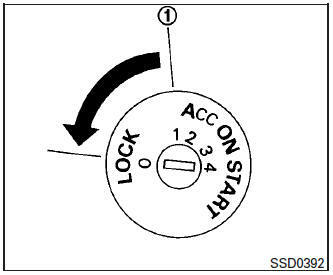 If the shift lever is shifted to the P (Park) position after the ignition switch is turned to the OFF position or when the ignition switch cannot be turned to the LOCK position, proceed as follows to remove the key. Move the shift lever into the P (Park) position. Turn the ignition switch slightly toward the ON position. The shift lever is designed so it cannot be moved out of P (Park) and into any of the other gear positions if the ignition switch is turned to OFF position 1 or if the key is removed from the switch. The shift lever can be moved if the ignition switch is in the ON position and the foot brake pedal is depressed. There is an OFF position 1 between the LOCK and ACC positions. The OFF position is indicated by a “1” on the key cylinder.